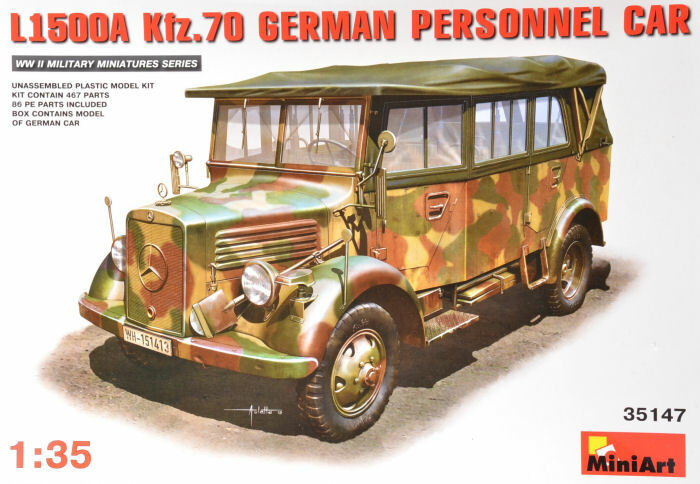 In 1937-44 the basic German light-duty military trucks were 1.5-ton chassis L1500E, L1500S (4x2) and L1500A (4x4) with petrol 4- and 6-cylinder engines of 44-60 hp. L1500E was produced in 1937-38 and had 44 hp engines. L1500S was produced from 1941 to 1944, 4100 pcs were made. Four-wheel drive L1500A was manufactured from 1941 to 1943 with about 4300 trucks made. L1500E and L1500A were equipped with 60 hp engine. Ambulance vans Kfz.31 were produced on the chassis of L1500E, and staff cars on the chassis of L1500A. The instructions are broken into an amazing 72 steps! If you have built MiniArt kits before, you will understand why! MiniArt absolutely packs every detail into their kits and this one is no exception. The instructions are well written and should be easy to follow. Another winner from MiniArt! Highly recommended! !